During the last years, targeted therapies have been incorporated to the treatment of patients with metastatic colorectal cancer. Whereas the main pivotal or registry studies of these drugs did not systematically exclude elderly people, they formed a minority of these cohorts. Data from studies nonselected by age and age-selected suggest that age alone should not be an exclusion criterion for receiving bevacizumab plus CT in mCRC. Fit elderly patients derive similar benefit in terms of RR, PFS, and OS with the use of bevacizumab plus CT. All studies are consistent in establishing that elderly patients have an increased incidence of ATEs with respect to younger ones, and therefore, those with a recent episode of myocardial infarction, stroke, or any other arterial thrombotic event should be excluded from receiving bevacizumab. 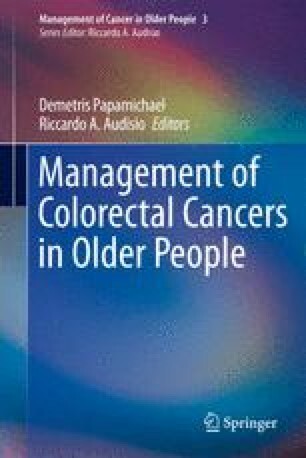 Cetuximab and panitumumab seem to have a similar safety profile in the elderly compared to younger patients, either as single agent or in combination with CT. Thus, age alone should not be a condition to exclude the use of these drugs in the mCRC treatment setting.